Organized Sunday, Oct. 25, 1925, Parkview celebrates 93 years of ministry, Oct. 25 2018. 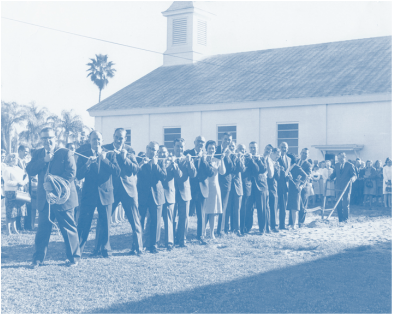 The earliest beginnings of Parkview are in a small Baptist church organized in 1921 located on the banks of the Indian River called Riverside Baptist Church. In a short while it became apparent that the location was not conducive to growth and expansion. ​It was decided to sell the property and make plans to relocate. In June, 1925 Riverside church was able to secure property on the edge of town in the Pinewood subdivision. The members of Riverside voted to disband on October 24, 1925. On Sunday October 25, 1925, a meeting was called for the purpose of organizing a new church to be located on the Pinewood property. The meeting was held in the St. Lucie County Courthouse. Parkview Baptist Church was organized with 51 charter members with the Rev. J.M. Lewis, pastor of Riverside, called as pastor of the new church. While construction of a new building was underway, the church continued to meet in the courthouse, with a Sunday school, morning, and evening worship services. On May 2, 1926 the first prayer meeting was held in the new auditorium. The formal opening and dedication was observed on Sunday, August 1, 1926. When the Indian River Baptist Association met at First Baptist Church of Stuart on October 14, 1926, messengers for the new church were recognized and seated. Parkview Baptist Church was now included in the membership of the Indian River Baptist Association. For 90 years, Parkview Baptist Church has experienced the joys of spiritual growth as a multitude have been saved and many have been called to Christian service. In the past 90 years, Parkview has had 22 pastors, many dedicated ministers of music, youth and education and a long list of deacons, church officers and workers who have served faithfully. By the Grace of God, Christian love, concern and a working faith have been extended from Parkview Baptist Church to the surrounding community and the world. Parkview has been in ministry for 92 years in the heart of Fort Pierce – The Sunrise City – reaching, teaching and ministering with the Good News that the Gospel of Jesus is for all who call on His name. Parkview is located at 403 Hayes Road, facing Pinewood Park on U.S. 1, just south of the historic Downtown district. Parking can be found in three lots on the church campus with access from Hayes Road and Pinewood Drive. For more information, you can email info@parkviewfortpierce.com or call the church office at 772-461-4245. ​Gideon Long is called as pastor of Parkview in 1965, serving till 1972, leads work on new education programs and facilities. An aerial view of Pinewood Park from 1937 shows the surrounding neighborhood in Fort Pierce. The intersection in the foreground is U.S.1 (left) Sunrise Blvd., (center) and Georgia Ave (right). Built in 1926, the original sanctuary for Parkview Baptist Church is shown facing the park in the top left area of the photo. The current sanctuary now stands at the same location.